R2D2! You know better than to trust a strange package! Three decades ago in a galaxy not so far away, filmmaker George Lucas launched Hollywood’s Star Wars phenomenon, and now the U.S. 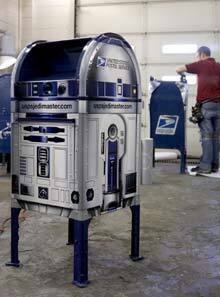 Postal Service is celebrating the film’s 30th birthday this year by decorating mailboxes to look like famed droid R2-D2. Approximately 400 mail collection boxes have been wrapped to look like Lucas’s iconic beeping robot and will be distributed across 200 U.S. cities, postal officials announced Thursday.